New Leeds United boss Thomas Christansen enjoyed a happy first outing at Elland Road after his side beat a stoic Oxford United 2-0 thanks to goals from Kemar Roofe and Stuart Dallas. After a middling showing in pre-season so far, Leeds were made to work for their win by an outfit clearly well drilled by their manager, former whites assistant boss Pep Clotet. After a first quarter devoid of action, the match was burst into life by a well taken Kemar Roofe finish. The fixture was scheduled as part of Roofe’s transfer between the two clubs prior to last season, and the tricky forward was the lively throughout. Eunan O’Kane enjoyed a fine game at the base of Leeds’ midfield and controlled the tempo until he was replaced with ten minutes remaining. Together with Kalvin Phillips they looked assured on the ball, and it seems that they may well make up the midfield two for Leeds on Saturday. 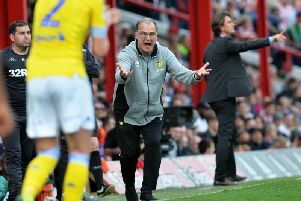 Leeds’ new found squad depth was in full display as six like-for-like changes were made, and Samuel Saiz was a handful in his final quarter cameo. He was part of the move that sent Stuart Dallas through, but few in the stadium would have guessed that he would be able to curl the ball around hapless Oxford keeper Simon Eastwood from twenty yards. Saiz’s fellow debutant Matthew Pennington, a teenage loanee from Everton, was a class act and may well be a shrewd signing for Leeds in the likely absence of Kyle Bartley. Leeds United team v Oxford: Wiedwald, Ayling, Pennington, Cooper, Berardi, O’Kane, Phillips, Hernandez, Roofe, Alioski, Wood. Subs: Green, Peacock-Farrell, Denton, Anita, Gomes, Jansson, Bridcutt, Klich, Dallas, Saiz, Sacko, Antonsson, Doukara, Ekuban, Vieira, Shaughnessy.